Vous souhaitez poser une question à l'établissement Wanathara Resort ? Si vous cherchez un établissement adéquatement situé à Phitsanulok, ne cherchez pas plus loin que le Wanathara Health Resort and Spa. L'hôtel se trouve à 46.0 km du centre-ville et permet d'accéder aux infrastructures urbaines les plus importantes. Cet établissement se trouve à proximité d'attractions populaires de la ville, telles que Chute de Kaeng Song. Profitez d'une multiplicité de services et d'équipements incomparables dans cet établissement de Phitsanulok. Les WiFi dans les espaces communs, parking, service en chambre, restaurant, concierge ne sont que quelques-uns des équipements à la disposition de chaque hôte. Profitez d'équipements de qualité supérieure durant votre séjour. Certaines chambres sont équipées de internet sans fil (gratuit), climatisation, bureau, balcon/terrasse, télévision câble/satellite, qui permettent aux hôtes de se détendre et de recharger leurs batteries après une journée bien remplie. Vous pourrez profiter toute la journée de la détente que procurent piscine extérieure, massage, piscine pour enfants, jardin, sports nautiques (non-motorisés). De superbes équipements et un excellent emplacement font du Wanathara Health Resort and Spa le point d'ancrage idéal d'un séjour à Phitsanulok. Des frais de 90 THB s'appliquent pour le petit-déjeuner des enfants âgés de moins de 5 ans et séjournant en utilisant la literie existante. The place was excellent! It is a place for a holiday away from the city. Lots of trees around, the pool was nice, and scenic river. The thing is the place seem need better management. They have small menu and mostly not available. The restaurant area was like a mosquito breeding area. No wifi inside the room so be prepared. The staff doesnt speak english. Overall great place! Thank you for choosing our hotel. Hope you come back again. The resort is fantastic. With nature all around. However, if you bring a dog, you will need to pay 400 bath extra per night for your dog. Which is not mention anywhere in the listing. The picture showed a big bed though when we arrive, they have us room with 2 small beds until we insist to get what we booked for then they gave us another room. The room is quite rundown and the bed is not the most comfortable. The pool is nice and the surrounding worth a visit. Thank you for your comments. First, we have to apologise about any mistakes during your time at the resort. We change the policy about taking dogs with your journey by reducing the price to 200 Baht per time. In addtition, we already added the information about this policy in the reservation details. Finally, on behalf of Wanathara Resort, we are deeply thank you for staying with us and hopefully you will come back. Best Regards, Sales & Reservation Dept. nice enough hotel but the rooms are small and the bathrooms are smelly. the western food is terrible but the Thai food is excellent. lots of mosquitoes and if travelling with young children there are lots of places to watch out for. I think it was overpriced for what it was. I'd stay again if I had my dog with me. Thank you for the opportunity to serve us. For feedback, we would like to improve. For the next service This will not happen again. Thank you for choosing the brackets. Stopped here for trip rest. Beautiful estate and decor. Stayed in very cozy bungalow with all the amenities. Very good restaurant and the resort grounds were well maintained. Left, didn't stay it was that bad. No health or spa, in fact zero facilities, very shoddy rooms (old little huts), no upkeep on grounds at all, no food available, only singh or water as your drink options in a dilapidated eating area (although no food). Rude staff (wouldn't accept my driving licence as ID for 30 minutes - it was all I had), Took one look at the room and checked-out. 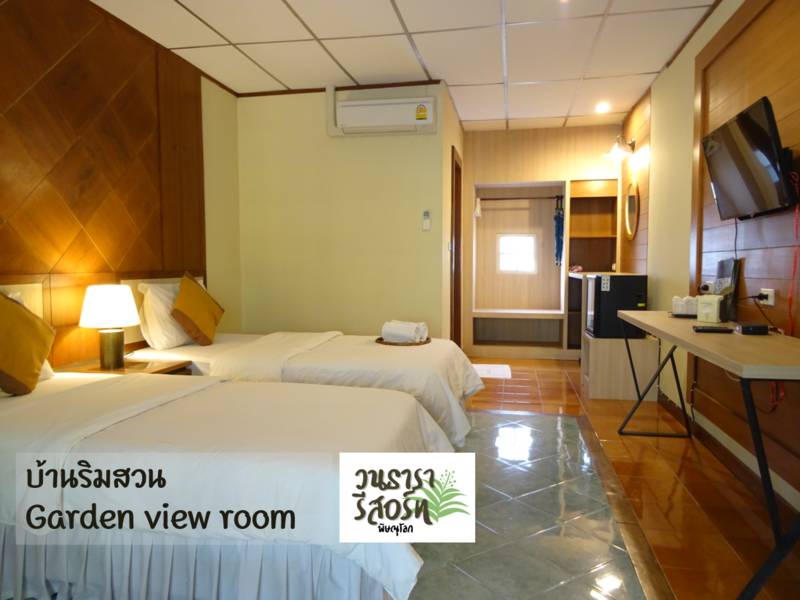 - This is a 200 baht room a night maximum!. Actually i'd call it a con. Do not be fooled by the pictures, probably taken when new. 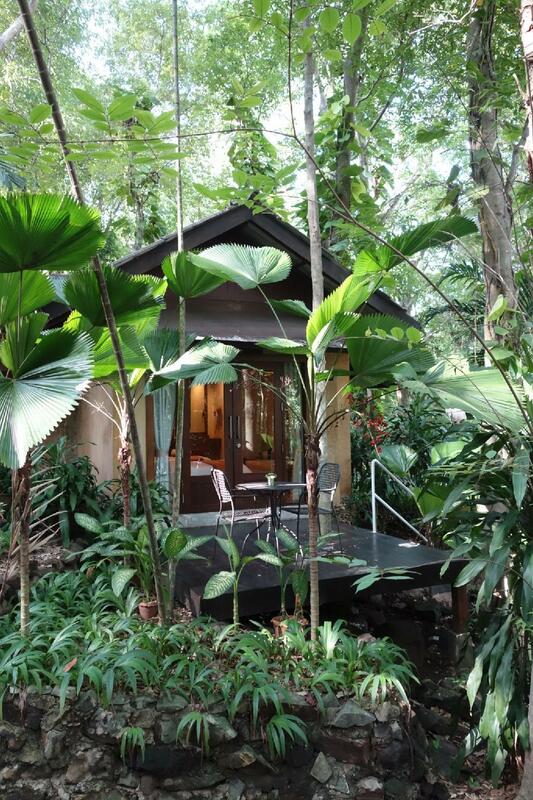 Very quiet hotel in the mid of the jungle. When we book this hotel on Sunday night. We are just only the customer there. Very quiet! 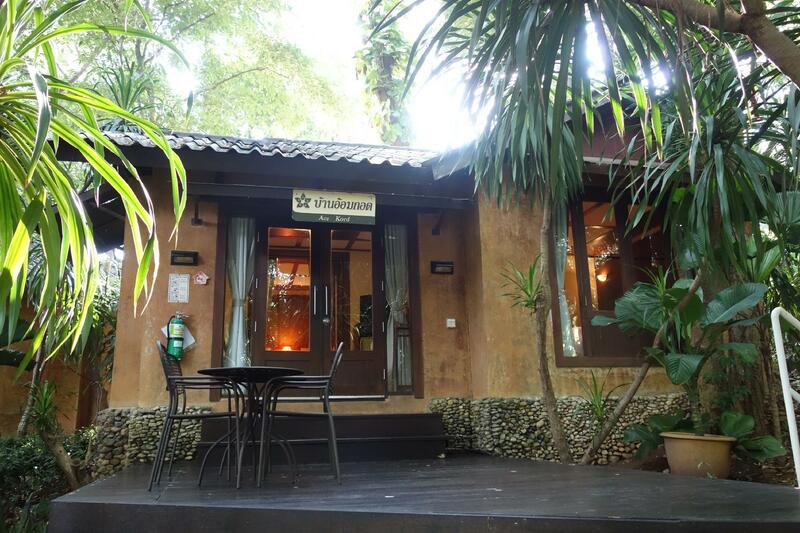 if you don't mind of you are in the mid of the jungle then it would be perfect for you, the staff are very nice the location next to the river and very good swimming pool. Good value. The landscaping is beautiful and the grounds are very well kept. We loved the saltwater pool and running around the big bicycle loop track. Super relaxing and wonderful. The rooms are just ok, so don't come here expecting to hang out in your room all day because you'll get bored. Rooms are very basic, but totally sufficient. The hotel grounds are stunning and very well landscaped. We loved running 5 miles every day around the resort, then relaxing with a swim in the beautiful infinity pool that overlooks the river. We were extremely relaxed and felt very welcome here. It was a bit odd (and wonderful) that we were the only guests staying for the two nights that we were there. Breakfast was good, and the service was 5 -stars. Wonderful place and we would go back again for sure. Yes, the rooms are a bit worn and the facilities dated, but they really make up for it with the price, the beautiful landscaping, and the pool. Like I said - don't come here if you plan to hide out in your room the whole time as you will be disappointed. Otherwise, you'll love it as long as you're not too picky and can handle an older resort. If you're super picky and expect 5 star everything, go somewhere else. This place is for people who are down to earth (and for any Thai people, of course). I brought my dog with me and we were made very welcome. Enjoyed the infinity pool overlooking the river and you can see the rafts/boats passing bye. My purpose for the trip to get some quiet time, and it's really peaceful and quiet. We'll be back often. Great place to get away,quiet and relaxing. the resort has a jurasic park feel about it.r room is a cute cabin that has 1950's style to it.you are about 50km from phitsanulok city in the countryside by a small river.no smoking or drinking at the swimming pool.the pool is small,but well maintained.the restaruant is closed by 8pm. Good old resort with beautiful nature surrounding. Beautifully location, the staff were very friendly, breakfast was okay would definitely go back. Thank you for your comment. We hope to see you soon. It's disingenuous to have English options on the www but zero staff who spoke a word. Stay well away if you are a foreigner / farang. I speak basic Thai and struggled . Some staff were pleasant others plain rude. We drank 3 beers - that's all they had in stock. 4 k a night. A JOKE but the laugh was on us !! We arrived at lobby 5pm. The mama sang working at lobby said she could not find the booking no. Cuz she wasnt wearing her glasses. We pulled out luggage from our car by ourselves which is fine but had to put them back in cuz nobody informed that the room is 300m away. This place was probably made its time but now is badly maintained which is normal for Thai owned property. Though the site is very beautiful but with totally unprofessional staffs and disgusting toilet and lack of maintenance so it simply goes down very quickly. Thus considered very expensive for the price of 2k a night. My last straw was that at5pm the room was still not ready. Is this normal? If u r incapable to run a hotel, make it a pig cage wont b any more trouble for u and other guests. And pls for something sake..stop putting good pictures that the property perhaps took them 10years ago. Like I said what you see is a lame. Beautiful setting. Good price. Very relaxing atmosphere. Great setting beautiful garden surrounding but there were silverfish in the bed the power went out with my wife in the shower, staff was clueless when trying to get power restored. As well as in restaurant. Average stay. Clear, large room. Advertised Wi-fi was only available in reception area, not extended to rooms. Advertised spa and massage was non-existent. Parking limited to one side of street, making only one lane for traffic. Parking was100 meters from room.